In a very large bowl, mix together the oats, nuts and seeds, truvia, spices and salt. In a small saucepan, warm the fruit puree with the molasses, honey, and oil. Mix the warm liquid mixture into the dry ingredients until evenly coated. Place on two baking sheets. (If you have ones with sides them, it makes it easier when stirring.) 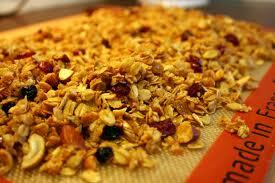 Bake the granola for about 45 minutes, stirring every ten minutes, until the granola is deep golden brown. 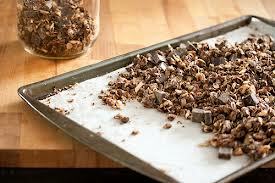 Remove from oven, while granola is still warm from the oven add in the dark chocolate tossing until chocolate begins to melt and form clumps in the granola. 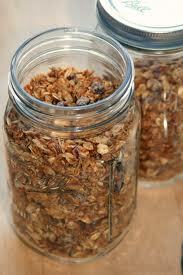 Place the granola into mason jars (the size is your choice), tie with a bow and give out as holiday gifts. The granola will keep for about 4 to 6 weeks in an airtight container.